Born on 29 July 1894 in London, England - son of William Thomas and Kate Searle, Toronto, Ontario - at the time of his enlistment in 1915: trade as carpenter; single; no current or previous military service; Church of England; height of 5 feet 6 inches; chest of 37 inches fully expanded; fair complexion; blue eyes; light brown hair. 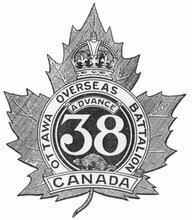 Joined the 59th Battalion, CEF, in Lindsay, Ontario, on 28 May 1915 - transferred to the 38th Battalion, CEF, on 22 June 1915 (number 410882) - served with the 38th Battalion during its period of garrison duty in Bermuda - landed in France with the 38th Battalion on 13 August 1916 - declared missing, presumed dead, on 9 April 1917 - name inscribed on the Vimy Memorial, France. (Updated with a photo of Pte Searle's inscription on the Vimy Memorial that I took in August 2012).